Okay, this one was just okay. 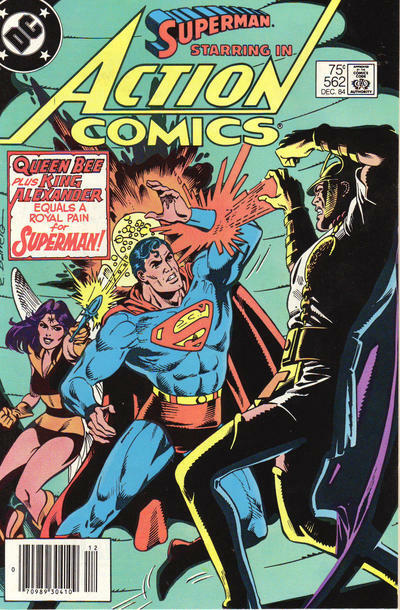 The villains weren't particularly interesting, and their schemes really didn't seem like they'd be that big of a challenge to Superman. I sometimes wonder if we should be reading these comics with the subtext that Superman is actually letting all of these things happen to him, just to either a) see how much he can take, or b) build up the villains so their defeats are more demoralizing. Which doesn't say a lot for the Man of Steel, either way. What I do like is having a bit of background on Queen Bee, who shows up in Morrison's JLA as part of an anti-JLA team of villains. One that's much more threatening than the team in today's comic. But they can't all be winners, and even if the story was a bit of a letdown, the art was, as usual, beautiful. The early 80s Superman artists were really on the ball.